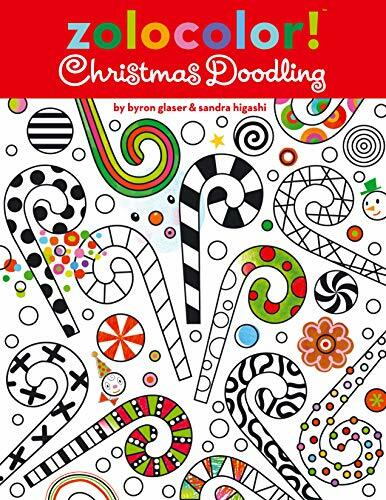 Have yourself a Zolocolor Christmas with this holiday-themed doodling book! Simple yet bold shapes come together to create images of snowmen, candy canes, elves, santas, and more in this Christmas-themed Zolocolor! book. The pages are adorned with festive holiday scenes—ranging from elaborate and busy to simple and quiet—that invite children (and adults!) to color in, out of, on, and around the lines. There are also five ornaments that children can color, cut out, and hang on their own tree! So get out your color pencils, chalk, paint, pens, or crayons, and draw from your vibrant imagination. Dabble. Dream. Imagine. Make it your own! And may all your Christmases be colorful! Byron Glaser and Sandra Higashi love to color! They are designers and illustrators of creativity-inspiring products, including the award-winning line of Zolo® toys and Curious Bonz™. They work in a variety of mediums including paint, collage, sculpture, and digital art. Byron and Sandra, both natives of Southern California, graduated from Art Center College of Design in Pasadena with Honors. They now divide their time between New York City and Fredericksburg, Virginia.